Speaking on ‘The Big Story’ with Host Cathy O. Richards, yesterday April 11, 2019, the new minister charged, “Immigration, it’s a big department. I get a lot of complaints about immigration,” he noted as he plans to upturn the department. The Minister also promised that throughout the process, the public will be kept informed about the developments as they unfold, while noting that his government will live up to their commitment of being transparent. Wow. Wow.. Great. I can speak personally of the harassment me and a few of my friends had.. With that P upstairs.. She would call us on the phone tell us to come in to see her. We get there waiting for about 2hrs when we see her she would say our photo ain't clear enough and we need to bring in a new one or our name ain't spell right in a reference letter or bank statement and we need new ones.. Things she can tell us on the phone when she talk to us instead of having us leaving our jobs for hours..... Change is really needed. People should always treat others good the way they would be treated because people don't forget the bad done to them...Today u up tomorrow u down ..
Mr. Minister just remember that our Imigrations have a job to do. Only in our island visitors can complain about the immigration service. Anywhere else they respect the immigration and readily follow the rules. Politicians should not interfere with the immigration once they follow the rules of the service. Remember they are the first line of protection for the country. If the minister really wants to resolve this issue, it's very easy, install survelance equipment so there is a full record of what takes place. I guarantee you things will change significantly. Until you live in another man's country and have to process with immigration you have no clue what it entails. No department is free of criticism. But immigration seems to get the worst name and some of it, some, not all is unfair. Once a person can't get their way they like to complain and embellish the situation. I feel bad for immigration workers. They should all quit because it must not be a good feeling to always be put down in the public as if no one in the department ever does any good. Moral must be extremely low for the workers in that department. Hopefully one day someone will have something good to say about the department publicly. But every politician and a lot of the public does put that department down to the lowest. 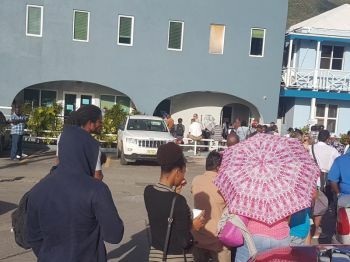 I say fix the law on immigration, get rid of the bad eggs, add more staff because it is too few persons in there to service the population in the BVI that need their service. Finally, please stop putting down an entire department it does not help the situation. Employees who are under-appreciated, under-perform. now this is a working person thank god burtie is gone! This Minister is just about talk and fluff. Notice he takes advantage of every photo opportunity? Watch and see and listen to hear what will be improved. Labour/Immgration, same kettle of fish. @girl watcher STFU! We don’t care! He will be our minister until we ready to replace him and that’s no Time soon! Get in line for he’s not leaving anyone behind including your sorry a&&! Has this Minister even met with the Department Heads or staff? Why is he working backwards? He gets lots of complaints but is he planning to investigate or just throw the staff under the bus? When he decides to meet with personnel, will he meet happy people or disgruntled people? All complaints are not legit. He sounds like one who is anxious to make friends. He should be careful. He is ready to turn the department upside down without even meeting to discuss issues, complaints, concerns. What the heck. There is good and bad everywhere and if there is need to pull weeds, then so be it. However, the parable of the sower should be consulted so that the wheat and tares will be treated equally. Nuff said. let the immigration officers do their work.